Cheesy headlines aside, it seems possible that the Star Trek game that was showcased at E3 2011 could make its way to the Wii U. 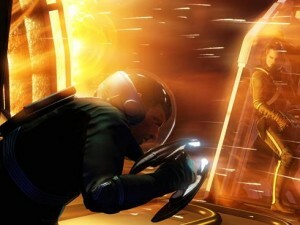 The game, which is being developed by Digital Extremes and takes place after the 2009 Star Trek film, was expected to release in 2012 but it has now been delayed to 2013. The highly anticipated game impressed at E3 with its intense co-op and pretty visuals. Yesterday, a beam of hope shone for Nintendo Star Trek fans when Paramount Pictures and Namco Bandai announced that the game would be released on “all major home consoles and PC”. With the Wii U expected to launch before the end of 2012, coupled with the delay of the Star Trek game to Q1 2013, it doesn’t seem too fantastical to believe the Wii U will receive a version. With me being a secret Trekkie, I really hope this is this case. Would you like to see the Star Trek game come to the Wii U? Wow, I never heard of this Star Trek game before. :O Hopefully it will come out on the Wii U so I can check it out. Get ALL the games to WiiU! so its almost confirmed now that its coming, AWESOME!! I hope so, it seems at this rate Wii U won’t have any games till 2013.
are you kidding? the launch lineup is huge!! Crackkat is right. Nintendo learned from their screwup with the 3DS launch and are making sure the Wii U has plenty of 1st-party launch titles, not to mention the 3rd-party games. It’s pretty difficult to determine what titles will be released beyond this year when the console has yet to be properly unveiled. My English teacher would not like the title of this article. You cannot split up the infinitive “to go” with an adjective. A Star Trek game? Why not? Bring it on and make it good please.